We feel so absolutely lucky to have found Brave Birth to help guide us through this most wild ride (5 days and counting until our due date)! After first becoming pregnant, we were planning to have just the two of us navigate this pregnancy, birth, and beyond primarily solo with some "baby classes" here and there. 2.5 months out from our due date, though, those thoughts started to change and the reality and honestly, fear, of it all set in. Luckily, for myself, I had met Megan about a month prior through a prenatal yoga class. I learned that she is also a Doula and it got my wheels turning. We had a wonderful free consultation, with my husband, and signed up immediately! The BEST decision we had made thus far! 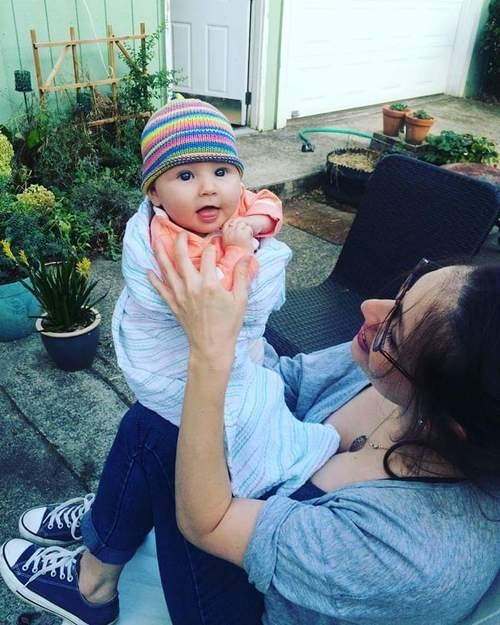 Megan, the Brave Birth Community (with prenatal support groups), the MindfulNest class, and Megan's prenatal yoga has been nothing short of amazing. Matt and I talk on a regular basis of how grateful we are to have all that Brave Birth and Megan includes - from the resources and evidence-based information, support groups, prenatal yoga, humor, and personal connections. My two most grateful aspects of Brave Birth at this time has been attending the MindfulNest class through Brave Birth, with Megan and Nicolette, and Megan's Prenatal Yoga! MindfulNest was the perfect balance of traditional child birth information, practical applications for all aspects of labor, and integrating Mindfulness throughout in a living room setting that made each 4 hour sessions fly by (always my gauge for a solid class)! I have found Megan's yoga to be a stellar balance of strengthening, breath, and functional rest all while learning about the applications for my pregnancy and birth. At 39 weeks I looked forward to her 5:30 PM class! She is one VERY talented yoga therapist! Although I believe, one can never be fully prepared for this life-changing experience, my prior fears have turned to a lot of excitement, curiosity, still a little angst, and a ton of confidence - Brave Birth is the perfect name for this awesome community! As new parents & young professionals we attended the MindfulNest Classes, and Prenatal classes by Megan Peterson. As a couple with high expectations, we have been so happy with every experience we have had to be both well informed with facts & tools, while also cared for and given personal support, ideas to navigate this experience. The classes offered were a perfect blend of all entities & we were given tons of data, support, and also a very human & compassionate interaction. By taking this class, we feel a ton more connected and prepared! There are so many stages of pregnancy, and childbirth, and beyond, we are so glad we found Brave Birth & all of the practitioners there as new parents! *Prenatal Yoga has been especially helpful and eye opening at how unique this stage is and Megan's classes really support every person, Yogi or not, throughout their pregnancy to feel their best and feel supported. My husband and I met Megan through her vibrant yoga classes and were so impressed by her positivity, sense of humor, and incredible depth of wisdom about the body, mind, and spirit. As I prepared for the birth of our first child, I asked several mothers what was most essential in creating a positive experience. Their recurrent advice was, “Hire a doula!” I instantly knew that I wanted Megan by my side. Megan served as an incredible support and knowledgeable resource throughout our pregnancy and birth. I felt more confident in facing such an enormous task as I was encouraged by Megan’s strength and experience. She was a grounding force even as our birth unfolded through a variety of unexpected events. Megan was an excellent communicator, a strong advocate for our wishes, and was physically and emotionally present through many late night hours of labor. I am certain that she led to far better care by medical staff than we would have received on our own. I was relieved to see how she was equally able to support both my husband and me, so that I could focus all my energy on giving birth. Furthermore, Megan went above and beyond what we had asked of her (running my placenta home after delivery, baking me delicious postpartum lactation cookies!) and helped to make the intensely vulnerable journey of welcoming our daughter into the world a beautiful one. I wholeheartedly recommend her skill and strength to anyone seeking an empowering start to parenthood. Megan was amazing at helping everyone be informed every step of the way. She helped us keep open lines of communcations when things progressed and have a calm presence to help everyone regulate. Megan was tremendous at helping my wife with informed advice on next steps of treatment and techniques to help during contractions. As a first time father she helped take the pressure off me understanding next steps and things to look out for. I would highly recommend Megan to anyone!!! I can’t imagine going through pregnancy, labor and birth without having Megan as my doula. She was absolutely INCREDIBLE. From our very first meeting, through my entire pregnancy I felt so comfortable coming to her for information, advice and support. She was amazing at talking to my husband and me about birth and prepared us so much for something we had no idea about. Her presence as SOON as I went into labor was so amazing, and without her support the day of I would have never made it through childbirth drug free! She communicates so eloquently, clearly and kindly and helped my whole support team do their best to support me. I’m forever grateful that we had megan on this amazing journey with us, and can’t wait (but I can a little bit ) until we get to go through this wonderful process again with her support! Megan is fantastic! We were very happy that she helped us welcome our baby daughter into the world. During pregnancy, my wife and I had many questions and Megan really listened. If she knew about the subject, she would talk to us about it and, if she didn’t, she would seek it out and get back to us. If we just wanted more information, she would loan us books from her library. If my wife’s body was hurting, Megan used her prenatal yoga knowledge to give us safe exercises to try. Throughout the process she was very thoughtful, patient, and calming. Megan is well connected to the birthing support community. She invited us to a pregnancy support group which helped us because it introduced us to other pregnant couples. Also, because of our age, the doctors wanted to induce on or just before her due date. Not wanting to get a chemical induction, we talked to Megan, who connected us to an acupuncturist. We made an appointment for a few days before my wife’s due date and 8 hours after the appointment my wife was in labor! During labor, Megan’s help made everything easier. Megan could sense when my wife needed support and would jump into action. She brought electric candles, music, and supportive words and actions that lightened the mood and made labor easier. I was able to take a break to walk and get food nearby while she stayed with my wife. There was even a mini-dance party after my wife was given an epidural that made everyone smile. Post labor, Megan checked in on us, made sure we were on the right track, and shared some thoughts on lactation. I can’t say enough good things about Megan. She was thoughtful and supportive throughout the process and gave us access to resources we wouldn’t have had without her. Yay for Megan! Like many first-time mothers, I had big expectations regarding my pregnancy and child birth. Some dreams were more realistic than others, but in the end, I credit my work with Megan for helping me to create my perfect birth story. My journey with Megan helped to prepare me physically, mentally, and emotionally for labor. She was there through almost every stage, as my body grew and changed. During labor she was a rock for my husband, who was a little unsure of what to do at first. I can’t say enough good things about her beautiful spirit and I can’t wait to welcome our next baby, with Megan by our side.